Years ago when our kids were small, and my brother and his family were visiting from out of town, we all decided it would be fun (and tasty) to have fresh lobster for dinner. My husband set out to purchase the marine creatures from a local fish market and returned with some very live lobster. After the lobsters were placed in the water and it was boiling, there came a point when they sounded as if they were "screaming", for lack of a better word. Well, my daughter became very upset and began crying! I quickly took her from the room before she became too traumatized. The lobster cookies didn't make any noise when they were being baked and caused no trauma to any children, unless they had to wait until after dinner to eat one! 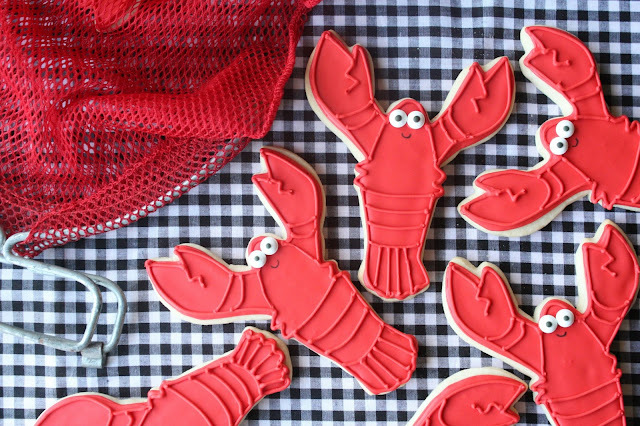 Use a lobster cutter to cut out cookies (3/8-inch thick) and place on baking sheets. Bake at 350 degrees for about 15 minutes or until beginning to brown on the edges. Let cookies cool completely on cooling racks. Using red gel food coloring, dye the royal icing. With a #3 tip and piping consistency, outline the lobsters. After about 15 minutes, fill the lobsters with thinner royal icing. Let dry for about an hour and then add the details to the lobsters with a #2(or #3) tip, whichever you prefer. Add the candy eyes with a dab of royal icing. That is the one reason why I can't buy live ones. But love the cookies!! Oh my goodness the cookies are too cute! (I won't eat real lobster due to similar traumatic experience as a child similar, ok the same as what you daughter experienced). These, I won't have a problem trying. We started a tradition a few years ago with our kids where Brian buys live lobsters and prepares them for our Christmas dinner. Brian gets a real kick out of picking them up and chasing the kids around the house with them. Needless to say, the kids have no problem eating them (and love the taste)! These cookies are too cute Sue and I bet they are really yummy too! Oh these are adorable. My mum once bought live lobsters. she put them in the basement to keep cool and out of the way until cooking, thinking the cold also my lul them into some sort of sleep so she wouldnt feel as bad once cooking (I have no idea where she came to this theory) she came downstairs to find one trying to escape! Sue, these cookies are just adorable!! Haha, poor thing! My grandfather was a crabber and I distinctly remember the sound of the crabs being steamed (they clatter around quite a bit - which is understandable, it is a rough way to go!). I didn't think about it at the time - thankfully! poor thing! same reason why I cant do lobster at home. The hubby has done it once or 2 and i leave the room---it's just not right. I'd be a vegetarian if I had to kill my own food. These lobsters I can definitely deal with!! But nothing against these gorgeous cookies! Oh, I love how made their eyes so bubbly and cute! 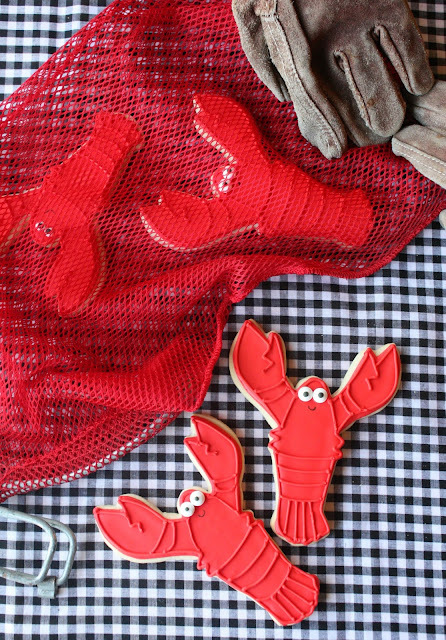 These lobster cookies are so adorable! I could never bring myself boiling life lobsters. Ever. And they don’t cost as much as the real big ones! This is a fantastic way to bake cookies. Where can you get the lobster cutter? Can you buy it online? I’ve been hunting for one but can’t seem to find it. 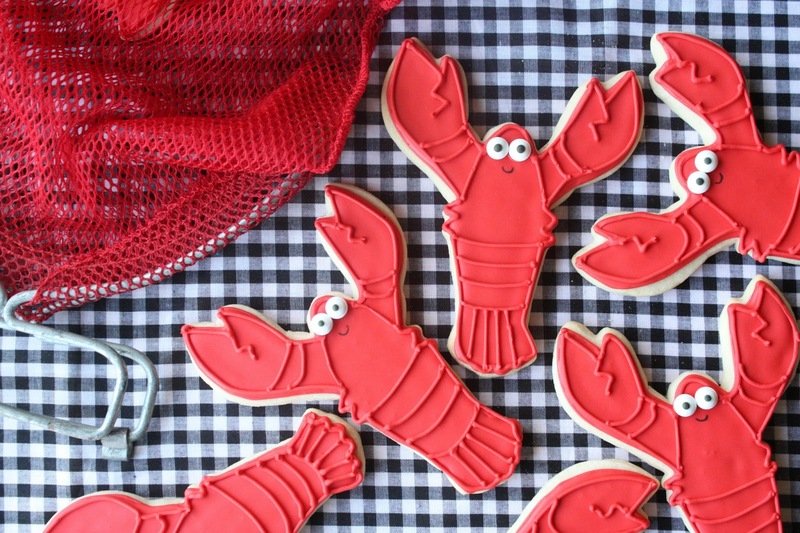 I hope you can help me find one so I can shape my cookies into lobsters. That's so funny! My kid wouldn't like that either =o) And your cookies? AMAZING!!! I can't eat real lobster but I'd take a lobster trap full of these cookies! They are perfectly decorated and I love the eyes. Besides being adorable...THE PHOTOS! In love!